We are going quantum over the past two weeks! We have a multitude of frequencies bombarding us in which all serve a different purpose in our physical body ascension and acclimation to New Earth. We have the fluidity of photons bouncing around our cells converting to plasma. This occurs now due to solar minimum, and high geomagnetic activity entering the New Earth atmosphere penetrating all on a cellular level. This specific barrage of photonic light is hitting the muscular network within where the old gridwork breaks down. This is where your personal grid/meridian lines exist, and tie into the New Earth crystalline grid. Old programming held within this gridwork also breaks down. This is why muscle soreness, even painful to the touch is experienced. A new gridding process is taking place within with more deep seating purging occurring. Many times these will be held in the teeth, skeletal bones, skull, nerves and the muscles, so you may experience discomfort in these areas while the purging process and re-gridding/re-wiring/integration takes place. For those who have been in this physical body ascension process for a few years now, this is where the last bit of limiting programming leaves the body on a cellular and DNA stored levels. All is processed through the Higher Self and Over Soul. It is much easier and quicker to “see”, then perceive from the higher self the full picture, forgive, release and let go…with a great deal of love. This can happen in a matter of linear minutes, or hours as you connect to higher geometrical information through the Akashic and Source. Much is cleared very quickly. As this density continues to leave the physical body, your crystalline light body becomes lighter and you enter the next phase of Avatar crystalline, plasma light body where you are activated and fully multi-dimensional. You are able to navigate the dimensions with great ease by adjusting your frequency to match each unique dimensional reality. You go up, and you anchor back down into the physical in full light body form. Here is there is no attachment to anything, or anyone as you anchor back down into the 3rd dimension to perform your soul calling/mission in service to others. Here is where your focus returns, and you can easily translate what you’ve been shown from your Higher Self to help teach others. This is also done with a great deal of love, and care for here is there no more ego getting in the way. As you are now a walker of dimensions, you notice it’s so much easier on New Earth. Things just flow as all is done on an Energetic level. All is in the now moment. Nothing is planned or controlled. Each is recognized from their dominant radiant auric field. Each auric field of dominance holds its own set of metaphysical and physical gifts to be in service of others. On New Earth everything is an energy exchange as all work together to maintain the harmonic resonance, and all live by the Universal Laws. Each holds themselves accountable to maintain this integrity with themselves and with others. It is impossible to lie as all see telepathically, and most communication in person is held this way including; the animals, plants and trees. You may have noticed over the past month, as I have written about before, also posted personal animal videos on my FB page… how now on New Earth the animals are more trusting to humans as we uphold respect for all creatures that inhabit the same energetic space we do. They telepathically know this, so they come to you, or allow you to approach them without fear on either side. There is no fear on New Earth. All trust in the Universal energetic flow. With a fluent and over soul understanding of the Universal Laws alchemy is normal. Abundance freely flows to all who remain open. On New Earth everything is heart centered and balanced. Every thing is done with pure unconditional love. All intentions are set, and sent with pure unconditional love. This is how the harmonic resonance is maintained. You cannot walk New Earth without having the purest of intentions at all times. Your karma is cleared from past lives through the Akashic and you obtain no more karma. You walk New Earth with a clean and clear slate. This is why the Crystal and Rainbow children come here with zero past karma, and why is it difficult for them to acclimate to 3rd dimensional density. They were the first to arrive to show us the way in unconditional love, telepathic communication and instant manifestation. They arrived on New Earth first. They are born here already inter-dimensional beings of Light and Love. They access New Earth and anchor the frequencies back down to 3D for adults to acclimate to higher frequency output who are directly tied to them. It becomes contagious as more want to catch that vibe and ride the wave. As inter-dimensional walkers, we do much work in the Astral collasping the old timelines, and allowing the new ones to present that are aligned to the New Earth crystalline grid. As above, so below. A lot of inner work is done as we deep sleep and twilight sleep. Twilight sleep in a calm, peaceful state allows the 3rd eye to open on command to “see” all through a higher state. All past lifetimes can be viewed here, and all karma cleared in 1-3 successive sessions. Your clean slate begins. Now the inner work continues on a DNA cellular level as new codes are received as the magnetite crystals throughout the body heat to activate and cool to rewire and reprogram. ALL old must go! All old thinking. All old thought patterns. All old grudges and un-forgiveness. All old friendships, relationships, acquaintances that wish to remain at the 3D frequency of lack and lower vibrational frequency. We honor their path and we lovingly let them go. For us to obtain physical ascension as a light body, we have very few, and very limited humans we interact with and allow in our energetic field now. Only those of the same vibrational frequency and New Earth mission are invited into our vibrational field, and the timeline/reality we are anchoring for others to access too when they are ready. When you get to this level there is nothing, or no one that will stand in your way, for you have worked too hard to allow someone to keep dragging you back, or down. In a loving, but sometimes firm manner you are prompted to call these people out on their bullsh**! You let your boundaries be known, and be it known that if they are crossed the relationship must dissolve. For many on the ascension journey there are circumstances where you live with these souls who choose to remain on 3D Earth. For many there is no choice in some situations caring for an elderly parent. We can only honor the soul contract on the highest level, and understand the the lessons we chose to learn and grow from, on both sides. Surround in love. With all of this being said, know there are many levels to obtain in the physical light body ascension process. It takes years to complete. What I am experiencing may be entirely different from what you are. At each level there are different experiences and different inner work that must be completed which make it different for all at any given time. There are times many of you are experiencing the same exact thing as me on a global scale. We write to explain it at all levels, and perspectives for those who are guided and drawn to the information to learn and understand. Particularly so not one soul going through this feels alone as you are never alone. The more one increases in frequency, the more you are pulled to your soul tribe, and they are pulled to you as you return to authentic self. These souls are your support system, your sounding board, where ideas and collaborations take place for New Earth. Where you give and receive love freely without expectations of anything in return. I have had many express to me that they met their soul mate through my FB page. Or they met a soul sister, or brother and have remained connected for years and are very close. This makes my heart feel so good!! I take with great care and love a higher responsibility for my page, and my websites to carry the highest vibrational frequency of love. I have blocked many nefarious beings off my page to maintain the ingrity of the space energetically. So when those come to visit, they have an uplifting experience, and “feel” the vibarational frequency of “love.” Souls are brought together in support so they don’t feel alone. Information and education are given freely to those who are guided to it. If I am processing, releasing, etc…(and yes, it is a continuous process of inner work for all), and I need downtime to do this… I do not post, or put any work out until I recharge to my highest vibrational frequency of love. Make note that there are those in this field who do take advantage of unsuspecting, trusting souls. You must always use your intuition to discern the information you are given. Does it feel right and resonate? Or does it feel bad and it’s sending off red flags? If someone tells you they have all the answers, we don’t. We share what we are guided to share, and what we have experienced thus far to assist, or have tapped into from our higher selves to see and share. If someone tells you they can help you ascend, this is a lie. They can only plant seeds that help you remember to go within and do the work. No one reaches physical light body ascension without putting in the personal time, self focus, introspection, energy and self inner work that is needed to get there. We must all do our part. When the plateau of enough souls reaches physical light body ascension, New Earth is visible to all who align with its vibrational frequency. There are those here now that shift back and forth from New Earth to 3D Earth, all the way to the 13th higher dimension, and walk between all. We will continue to do so to constantly anchor higher vibrational frequency here until the plateau is reached. When this occurs we will then only view 3D Earth from a higher dimension. We will no longer have to participate in it, and lower our frequency to deal with linear demands, or those who choose to remain on 3D Earth and run linearly until they transition. We will be able to see them, but they will no longer be able to see us. Higher dimensional realms of 4D, and higher cannot be seen unless you are in alignment and a vibrational match to that dimensional reality. This is why most cannot hear, see, smell, or feel their guardian angels, spirit guides, ascended masters (avatars), or Archangels. All reside in a higher dimensional realms of existence. To reach them, you must meet them where they are. They will not lower their vibrational frequency to meet you. They will give you signs, and synchronicities that trigger you to remember until you increase in frequency enough to match them… then see, hear, smell or feel them. We have now anchored New Earth frequency some years ago to create this new dimensional existence for all who are ready to see and dwell here permanently. I have some people say, “When I get to New Earth.” When I say, I’m already here, it’s hard for them to comprehend that this is a vibrational dimensional existence in a parallel Universe to 3D Earth, easily accessible for all to see who are in alignment. It is how other’s interact, it is how the animals interact with us. It is being connected to your soul tribe. It is being accepted for who you truly are at the soul level. It is practicing a service to others career, and practicing even energy exchange in your daily interactions with others. It is where your physical senses are heightened and your metaphysical gifts are online and on point…. and you use them in service to others, and for all involved highest good. It’s where unconditional love is given freely, and received freely. It is where the air is clean and fragrant. It is where All dwell in harmony. And so much more…. It’s only a matter of time until more come, and the plateau has been reached. You hear some ascension teachers talk of New Earth like we live here daily. We do, and then we open portals and stargates to come back to show and teach more. Then we travel back again. I’ve got to tell you, New Earth is absolutely stunning and incomparably beautiful to 3D Earth. The evolved HUmans that dwell here are the most unconditional loving souls I’ve ever encountered with nothing but the purest intentions. All are healed through an energetic level and with crystals, oils, plants and herbs. Many heal themselves through focused thought and intention spontaneously. There is zero negativity, and zero fear for everyone is responsible for their energetic output following the Law of Attraction. There are no souls here with egos as all transcended the ego before arrival. There are only fresh veggies and fruits to eat for those who “miss the taste.” No food is actually required as New Earth sun is the food to maintain the Light body in the physical. ALL animals and mammals are respected and honored, and therefore not killed for food. All dwell in harmony. All work together. Everything is an energy exchange. This is a glimpse many others have confirmed they witness as well in conversations I’ve had. Many see themselves as teachers in Metaphysical Schools where Metaphysical gifts are excepted, taught how to use in service of others. And where the strict laws of the Universe(s) are taught, and a code of conduct is verbally accepted to maintain the highest integrity of work in service of others. A higher counsel of elders make sure harmonic resonance is maintained at all times. The colors are more vibrant of New Earth, the water is fresh and clean. And all of the elementals, fairies, sprites, sylphs, etc.. allow themselves to be visible to you, as they now trust us enough to do so, whereas in the past they did not. There are no lower dimensional beings on New Earth. Everything is in vibrational alignment to the vibrational frequency of New Earth. There is so much more I see, but I will wait to share more later as this is getting a bit long. But I will add…The New Earth hologram is strictly of the light and love where all come with their “free will” intact. Instant manifestation of what is needed is done, well….instantly, but very responsibly. There is no greed here, but abundance is unlimited for those who remain in harmonic alignment of the vibrational frequency of New Earth. Most live very minimally by choice. I’m sure many of you will resonate with some, or maybe all of these descriptions as many have now experienced New Earth reality by being walkers of inter-dimensional realms and realities. 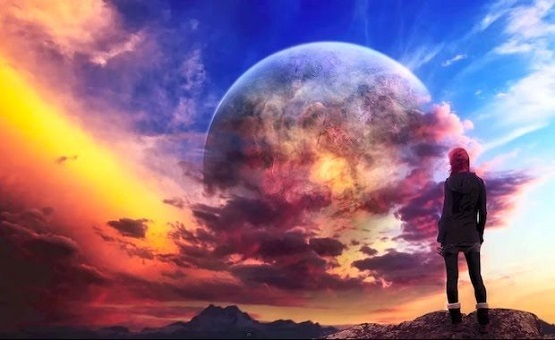 Now, to the last few weeks….What has transpired as many have increased in higher frequency, and have completed more of the ascension light body levels I described above. 1.) Increased animal telepathy. Increased wild animal interactions, especially with birds, frogs, butterflies, squirrels. Our family fur babies as well; dogs, cats, have became way more “chatty” and we can clearly understand what they are saying and what they want. And all of the sudden many can now see their fur babies who have crossed the rainbow bridge. The little souls of the animals are making themselves visible to all now who wish to see. 2.) More babies when out in public are starring at us, then burst out in smiles, and wave. They are looking above the head and see your energetic frequency and Aura. They are in Joy to incarnate into a less dense 3rd dimension than the last time. They also see our Angels and Guides hanging around us smiling at them too. 3.) The past four nights have brought a sweet, heavy floral smell that comes out of nowhere, and isn’t derived from flowers blooming near. For me personally, this scent only comes at night, the past four nights, and smells like gardenias, but a much heavier scent that lingers. I’m not the only one who can smell it, all who are with me at the time smell it too. I asked my friends on FB if they were experiencing this too a couple of days ago, and the response was overwhelming! See link at the end of the article for more info. A woman even noted she was out in the desert where there are no flowers at all around her and she smells this heavy floral scent too. 4.) The past couple of weeks sleep has been illusive. I have been unable to get to sleep until 3am-4am, or 5am. The past two days all I want to do is sleep, and went to bed at 9:30pm last night. A nap will be in order today, and it was all I could do to get this Energy Report out. 5.) Massive clearings through the sacral and root chakra causing many to run to the bathroom and just make it in time. 6.) Calling people out on their bullsh** and setting firm boundaries. 7.) Recalling past patterns that resulted in unsavory situations are being broken now. A life review of sorts to learn from the past and create a higher timeline now by collapsing the old. 8.) Psychic activity has ramped up as it keeps doing so. 9.) The elementals, fairies, sprites, sylphs are now letting humans capture them in pictures and video. 10.) Dreams are more lucid and precognitive dreams are happening now more than ever. 11.) All physical senses are heightened. 12.) More conversations are happening from the heart and not the ego. 13.) The urge to move now where you are being called to is now unavoidable and undeniable. Now’s the time you make it happen. 14.) The left and right hemispheres of the brain have rewired and new neuropathways have been connected. 15.) Your sensitivity to everything on a energetic level is at an all time high. 16.) I’ve had reports of those healing themselves with focused intention and thought. 17.) The ability to instantly manifest is at an all time high. 18.) Your intuition and discernment have increased to be your guide. 19.) Metaphysical gifts are coming back online for many. 20.) Many now live daily being very responsible for, and cognizant of their thoughts and actions. Keeping it positive to manifest the same. 21.) Many are no longer willing to share their sacred space with those of a lower vibrational frequency. Even announcing, “This is my sacred space for you to share in. Respect that or you’ll have to leave.” There is zero tolerance for negativity, drama, narcissism, selfishness, or self serving behaviors. We just refuse to participate in toxic, or dysfunctional behaviors anymore. 22.) Many now make it a point to clean their space more frequently to keep the energy free flowing through their space, smudging or burning incense often too. 23.) Technology glitching is a daily occurrence now. We have increased in frequency so much, the frequency at which technology runs on is often times not a match to ours, therefore it will glitch and we can cause it to permanently malfunction if we are not in a good state of mind, or angry. I have “talked” a many electronics by into working. Try it! Some of these “new children” just have the magic touch too. As always, please share in the comments section what you are currently experiencing, and if it’s any of the above as a confirmation for you. I’d like to finish this update with some links for you to refer back to in reference to what I have talked about here today. It’s always nice to read other’s comments to know that you are not alone in what you are going through, or experiencing. Have you recently smelled the heavy scent of flowers out of nowhere the past few days? Please Click Here to be redirected to my FB page, and this particular post to take a look at other’s comments in reference to it. Click Here to see a video I posted on my FB page of how the birds are interacting now. Click Here to see another one, and Yes I talk to the animals all the time. 🙂 You’ll hear me in both videos chatting it up with the birds. Are timelines shifting for you? Click Here if there is more you’d like to learn, or understand about this from a post I shared in reference to it. Much love, light and blessings on your continued journey. This entry was posted in Uncategorized and tagged Abundance freely, Avatar crystalline, deep seating purging, density leaving your physical body, fluidity of photons, going quantum!, high geomagnetic activit, love, nerves, New Earth, no fear on New Earth, plasma light body, pure unconditional love, re-gridding/re-wiring/integration, skeletal bones, skull, solar minimum, soul calling/mission in service to other, teeth, Tiffany Stiles. Bookmark the permalink.